The last time a motorcycle was built withb single-suspension arms front and rear was in 1948, on the Imme, an obscure German 98cc two-stroke. Mounting wheels on stub-axles standard practice on automobiles - is virtually unknown on two wheelers, where the easiest way of achieving adequate rigidity is to support the axles on each side. However, now that manufacturers are studying new forms of suspension, wheels supported on stub-axles may become more common. 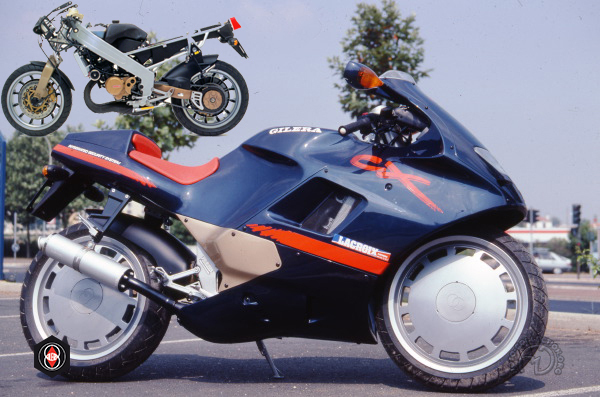 The Gilera front fork is made like an aircraft landing gear leg, with a large- diameter telescopic unit steered by a yoke and a single aluminum leg carrying the stub-axle. While this layout may not offer dramatic advantages, it eliminates the dead space ahead of the steering head necessary to accommodate a conventional front fork, allowing radical modification of the bike's aesthetics. Thanks to this, Gilera has been able to develop a style that is both aggressive and aerodynamic, with a plunging nose cowl that houses a complete instrument panel. The rear-suspension unit is laid out along more traditional lines. Its complexity comes from mounting the transmission and disc brakes on the same side.